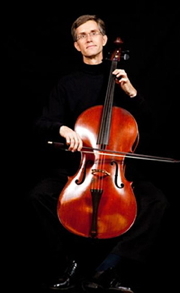 Christopher Haritatos has gained a reputation as a passionate and intelligent performer as both a Baroque and modern cellist. His work with period-instrument ensembles has spanned three continents and has brought to life music from the 1500s through the 1800s. He has collaborated in chamber music with artists such as Marc Destrubé, Kristian Bezuidenhout, and Sergiu Luca, and has played in ensembles such as Apollo’s Fire (Cleveland), the Handel and Haydn Society (Boston), and Tafelmusik (Toronto), as well as Austin’s Texas Early Music Project and La Follia Austin Baroque. While living in Europe, he was the continuo cellist of Fiori Musicali-Barockorchester Bremen, with whom he took part in several recordings and tours, and worked with The Harp Consort, directed by Andrew Lawrence-King. His major teachers were Alan Harris, Steven Doane, Pieter Wispelwey, and Jaap ter Linden, with whom he studied as a Fulbright Scholar at the Akademie für Alte Musik Bremen. Chris is now based in Rochester, NY, where he is a member of the Rochester Philharmonic Orchestra, plays with Pegasus Early Music, and is the cellist of Fioritura. Also sought after as a teacher, he has been on the faculty of Texas State University-San Marcos and has given workshops and master classes at several other colleges and universities.